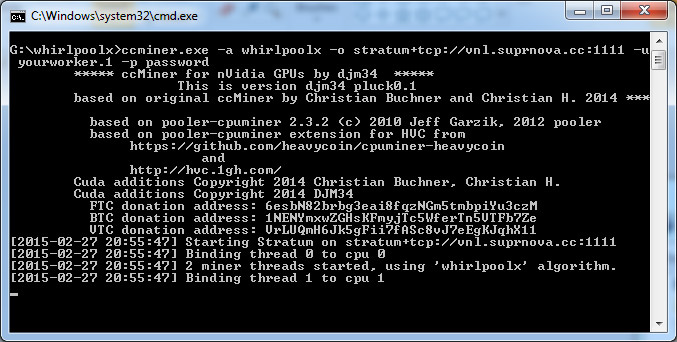 The WhirlpoolX algorithm is now supported in both the latest updates of the ccMiner forks from SP (source) and Tpruvot (source). So we have compiled windows binaries from the latest source for both miners and decided to test the performance we are getting mining the WhirlpoolX altcoin Vanillacoin (VNL). 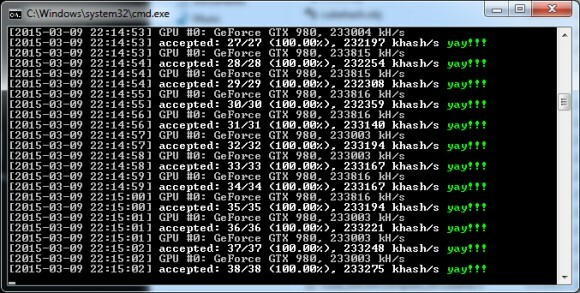 Do note that the sp-mod fork of ccMiner is optimized and supports the newer Computer 5.0 and 5.2 Nvidia Maxwell GPUs where the performance is maxed out while the tpruvot fork supports Compute 3.0 or newer video cards. We have tested the performance we are getting on GeForce GTX 980 GPU with the two miners, the SP version as expected gives out higher performance on a Maxwell card as expected with about 233 MHS while the tpruvot fork is not that much slower with about 222 MHS mining WhirlpoolX. So if you are mining WhirlpoolX on Nvidia-based video cards or leasing your hashrate you might want to update your miner to the appropriate version depending on your GPUs.